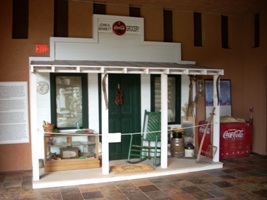 A replica of the Bennett Grocery Store in the Salacoa Valley is on display. This exhibit reconstructs, on a smaller scale, the front porch of the general store and touches on the "feel" of the country and why city folk often long to return. It is an honor to have the museum of the Funk Heritage Center named for John H. Bennett, Sr., '25 and his bride, Ethel C. Bennett. Children who visit the museum have an opportunity to see what a general store looked like and learn how families shopped in years gone by. Although now closed, the Bennett Grocery Store still stands in the Salacoa Valley, about five miles north of Waleska. The store replica includes a photograph of John, Sr. in one window and a photograph of John Bennett IV, his great grandson, as a child in the other. John H. Bennett, Sr. was born on August 25, 1906, and was one of 11 children. His family relocated from Virginia to the Salacoa Valley in Waleska, a lush and fertile valley near Reinhardt. John Bennett, Sr., attended Reinhardt Academy (which would become Reinhardt College then Reinhardt University) and Mount Berry School until his father's illness and eventual death. At that time, he returned to take over the family farm. In 1933, he married Ethel Cook, and in 1940, they opened their grocery store. Five generations of Bennetts have lived in the Salacoa Valley, and they have always been very active and well regarded to the community. Many members of Bennett family have attended Reinhardt. Mr. Bennett, Sr. died in 1996, and his bride passed away in 1999. They were married for 63 years. Their son, John H. Bennett, Jr. '65 serves on the University's Board of Trustees.